A heart attack is not the same thing as cardiac arrest. It’s important to know the difference between the two and what steps to take should you suspect either. Unlike a heart attack, in which symptoms can start slowly and develop over a few days or weeks, cardiac arrest occurs suddenly and without warning symptoms. It is signaled by a malfunction in the heart which causes an irregular heartbeat, preventing the heart from pumping blood to vital organs, including the brain and lungs. If not treated immediately, a person can die within minutes. 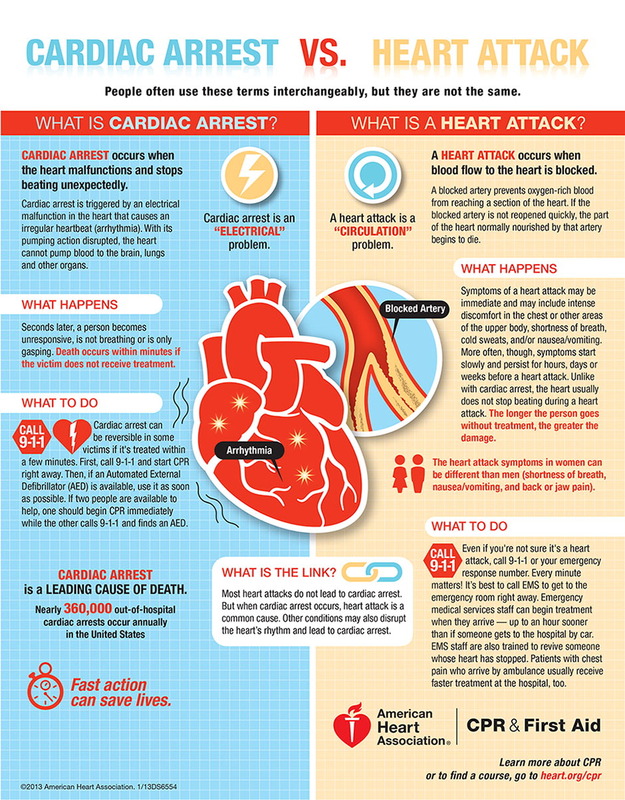 Cardiac arrest can occur after a heart attack, and heart attacks increase the risk of cardiac arrest. 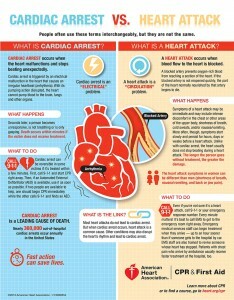 What to do if you suspect a heart attack is occurring? First, call 911, and if you can get the patient to the hospital sooner than waiting on emergency response, do so. If you suspect cardiac arrest, first dial 911, and if an AED is present, use it. CPR should also be performed immediately while waiting on emergency response, as cardiac arrest can be reversible if treated within the first few minutes. It’s never too late to learn CPR. Contact us online or at 866-990-2772 to book a class in Raleigh/Durham or Richmond today!